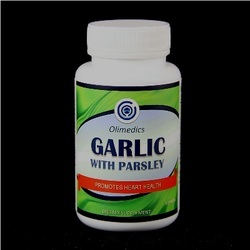 ​Garlic promotes heart and cardiovascular health and helps maintain cholesterol levels。 Garlic also contains beneficial antioxidant properties. Parsley (petroselinum crispum) is a chlorophyll-rich member of the carrot family. Besides health benefit, parsley is also garnish and breath freshener. Take 1 softgel orally 1 to 3 times daily preferably with meals or as directed by a healthcare professional. CONTAINS SOY (SOYBEAN OIL).This product is manufactured and packaged in a facility which may also process milk, soy, wheat, egg, peanuts, tree nuts, fish and crustacean shellfish. KEEP OUT OF THE REACH OF CHILDREN. DO NOT USE IF SAFETY SEAL IS DAMAGED OR MISSING. Active ingredients: Garlic, Parsley, and Chlorophyll.